Cooling large surroundings in summers is quite a challenge. Installing air conditioning units may not always be a feasible option in most cases largely because of its technical setup and high investment & operational cost. If you’re looking for an economical and effective solution to cool your high profile venue, then our fan mist cooling systems can be a great option. We offer high performance and affordable fan misting systems that are exclusively designed and engineered to cool large spaces and high profile venues. Our systems are repeatedly selected to cool venues like theme parks, 5 star hotels, resorts, sports grounds, industrial plants and restaurants. Our fan misting systems come with a lifetime warranty on mist rings and 1 year warranty on the pump, other components and fans. Our fans are UL 507 certified which makes them best for outdoor and indoor use. The stainless steel enclosure makes then robust, durable, corrosion resistant and low in maintenance. Since it is rust proof, even if it is exposed to rain or harsh weather elements, you don’t have to worry. Your investment in our misting systems will remain safe for years to come. Unlike other misting systems which can be noisy, our systems are both aesthetically appealing and whisper quiet in operation so you can easily install them in your restaurant settings and hotels to compliment your peaceful and luxurious surroundings. Besides this, our fan misting systems feature high performance motors with thermal overload protection. Also, the mist generated is of the ultra-fine quality which means the mist evaporates quickly and creates a cool zone instantly without wetting the floor and the clothes of your guests. 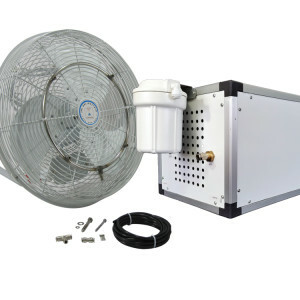 For more information about our fan misting systems, get in touch with us today!